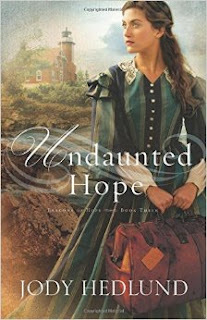 I so enjoy Jody Hedlund's writing, so I was very excited when Undaunted Hope showed up in my mailbox. Book #3 in her "Beacons of Hope" series, it was a wonderful addition. Here's the blurb, and we'll chat on the other side! First off, as anyone who has read a Hedlund book will say, this author does her research. Every detail is paid attention to and oftentimes her characters are taken from the history of real people. Undaunted Hope is no exception as she loosely based Tessa on the wife of a light keeper. These author traits only deepen the setting, and story and the reader greatly benefits. But Hedlund doesn't just do research well. She also writes beautifully, creating strong leads, organic faith elements, and multi-layered plots. I loved getting to know Tessa better in this book, and I could relate to her struggle between what she wanted to do and what God just might be leading her to do. Add to it two amazing male leads, and Hedlund was able to craft a love triangle that didn't feel overdone. I knew immediately which man I rooted for, but it was a fun ride waiting to see if he'd be the one to end up with Tessa at the end. With just a hint of suspense, tons of smile-worthy romance, and a stubborn young woman who only wants a fresh start, Undaunted Hope allows Hedlund's writing to once again shine, and I cannot wait for book #4 in this series. If you haven't read any of them, you can easily start here, but I'm going to recommend you read them all. They are simply that good. I happily give Undaunted Hope 5 out of 5 stars and you can purchase it here.